Verizon’s big BOGO (buy one, get one) deal is now live and it’s quite the deal, to be honest. 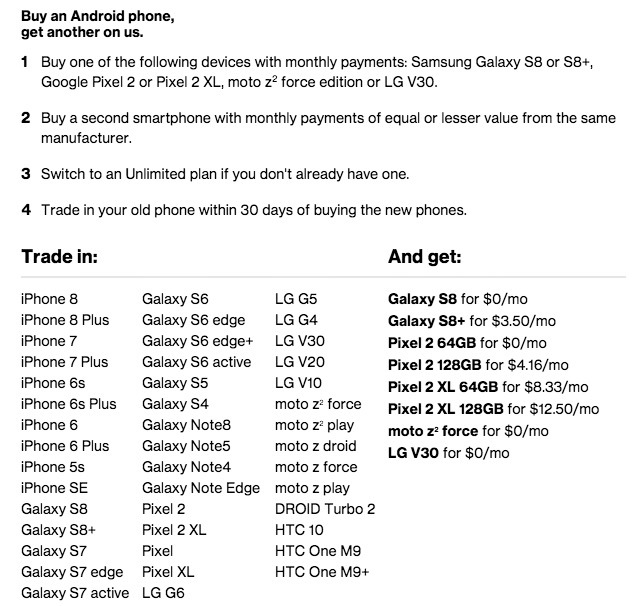 If you take advantage (both current and new customers), you could get a Pixel 2 or 2 XL, Galaxy S8 or S8+, V30, or Moto Z2 Force, along with another for free, as long as you trade-in another phone. In order to get the deal, which is only here for a limited time, you pick a phone that you’ll buy on a device payment plan. For the second phone, you’ll do the same (another payment plan), but in order to get the deal, it has to be from the same manufacturer as the first phone. You then have to switch to an unlimited plan, if not already on one, and then trade in your old phone within 30 days. 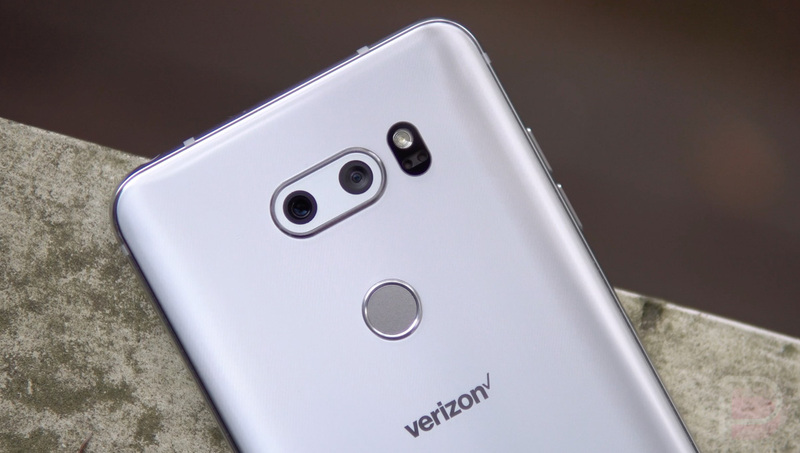 The list of phones that are acceptable for trade to Verizon include devices like the Galaxy S6/S7/S8, LG G4/5/6/V10/V20/V30, Moto Z and Z2 lines, HTC 10, and a whole bunch of iPhones. The full list can be seen below. There are a couple of extra things to note here. For one, it’s not a true BOGO depending on the phone you buy. As you may have noticed above, there are still monthly prices for some phones, though they are still steeply discounted. While it’s not entirely clear why, it looks like that’s because Verizon is only doing $840 in promo credit for the 2nd device and spreading it out over 24 months worth of payments. Also, the 2nd phone has to be on a new line and the trade-in will be applied as either credit towards monthly payments or as a VZW virtual gift card. Up to $949.99 device payment purchase per device req’d. 2nd phone of equal or lesser value & of same manufacturer. Up to $840 promo credit applied to account over 24 mos; promo credit ends if trade-in requirements not met or when balance paid or line terminated/transferred; 0% APR. New line of service req’d. Trade-in must be in good working & cosmetic condition; applied as account credit or VZW virtual gift card, within 2 wks after receipt of device at Verizon. Trade-in must be submitted within 30 days of purchase or credit will be charged back to account. I know that’s kind of confusing, but if you are ready to be locked into Verizon for two years, you can get two of the best Android phones for the price of one for a short period of time.